« It’s All in the Game! 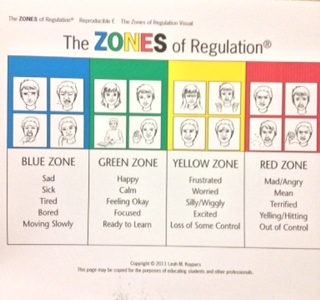 In order to understand how our emotions influence our behavior as well as the behavior of others, we started the Zones of Regulation (Leah M. Kuypers,MA Ed. OTR/L). Today we talked about the four zones: BLUE(tired, sick, sleepy), YELLOW(frustrated, worried, silly, loss of some control), RED(mad, mean, yelling, out of control) and the most important zone GREEN(happy, calm, focused and ready to learn). 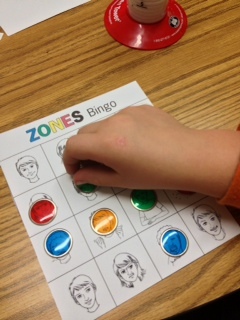 After discussing the zones with some vivid facial expressions, we played a game of ZONES BINGO. 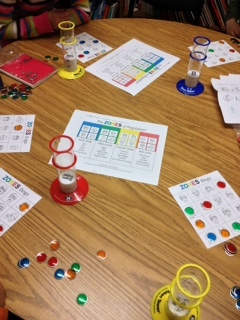 This was fun and helped us find areas of emotional regulation that may be preventing us from being in the GREEN zone. One student was yawning during the activity and we talked about that being in the Blue Zone. He told us he was frequently tired. We will continue the ZONES program to give students a method to understand, monitor and regulate their own personal zone. We want everyone’s favorite color to be GREEN!! Where did you get the see through colored disks? Mary, those disks came with a game from Super Duper Inc. Not sure, but you might be able to order them separately. where do you get the bingo sheets as well as the see thru colored disks?